Although he was there at the time of this interview, cooking was not on the agenda. Huang was busy rehearsing with pianist Helen Huang (no relation), who will join him on an eight-concert tour of Asia and North America, including Sunday’s performance here. The two musicians are from Taiwan, met as young children and are now friends and collaborators. When the violinist was 3 or 4 years old, he hated the instrument he has come to love and play so expertly. When his parents first took him to violin lessons, they later told him, it didn’t work out too well. But at the age of 7, Huang’s parents brought him to a concert and everything changed. “I was entranced by this wooden box that sounded so close to a human voice,” he recalled. “I was mesmerized by seeing the violinist onstage. I started lessons again on my own will. Huang, 27, was the recipient of the prestigious 2015 Avery Fisher Career Grant and the 2017 Lincoln Center Award for Emerging Artists. A member of the globe-trotting Chamber Music Society of Lincoln Center, he is also the principal violinist in Santa Barbara’s Camerata Pacifica. Primarily a concerto performer with orchestras and at music festivals, Huang appeared last November at Jacobs Music Center’s Copley Symphony Hall as the featured violinist on tour with the Taipei Symphony Orchestra. In 2016, he played at the La Jolla Music Society’s SummerFest and is set to return this year. 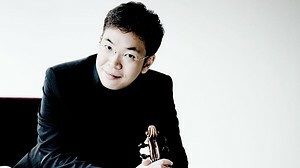 Huang’s program here on Sunday will begin with Dvořák’s Sonatina, Op. 100, followed by Prokofiev’s Sonata in F minor. Huang said the music is “quite heavy” before the intermission, but the second half will change the mood. “The concert ends with Saint-Saëns’ Sonata in D minor, which is colorful and virtuosic,” he said, adding that the popular piece is back in his repertoire after a break of several years. “To bridge the emotions from Prokofiev to the Sonata, we came up with two little pieces. Whenever there’s a recital program to curate, I approach it like we’re preparing a dinner menu for friends.